We are often encouraged to go for health checks to screen for various diseases. Do we need to do the same for our eyes? There are actually 3 important eye diseases that we need to look out for. Late diagnosis of these eye problems can lead to blindness. As all 3 eye diseases do not cause pain or redness to your eyes, you may not notice them until it is too late! I will briefly explain these 3 important eye diseases : Glaucoma, Diabetic Retinopathy, and AMD. Glaucoma causes loss of vision due to high pressure in the eye. This high pressure will damage the optic nerve at the back of your eye and cause loss of your side vision. As the damage worsens, the central part of your vision will become affected and you may notice a blind spot in your vision. By the time you notice this, the damage to your vision may be severe and irreversible. Glaucoma can be detected early on with regular eye pressure checks at optometrists or eye doctors. As there is often no pain or redness with glaucoma, we may not be aware of it. Glaucoma is more common in people who are myopic, above the age of 40 years, and who have a family history of glaucoma. Eye drops, laser, or surgery are treatment options for glaucoma and early treatment can prevent blindness. I have written extensively about diabetic retinopathy. It is the most common eye disease that retinal specialists treat. Patients with diabetic retinopathy may require laser, eye injections or vitrectomy surgery to prevent blindness. A regular annual retinal check is essential for all diabetic patients. This can be done by a simple digital photograph of the retina in the clinic or a full eye check with the eye doctor. The digital photo will then be graded and the patient asked to come back for a more thorough check if there are signs of diabetic retinopathy seen. AMD is the most common cause of permanent blindness in people above the age of 50 years. More details can be found here and I have written a book about prevention of AMD through diet. 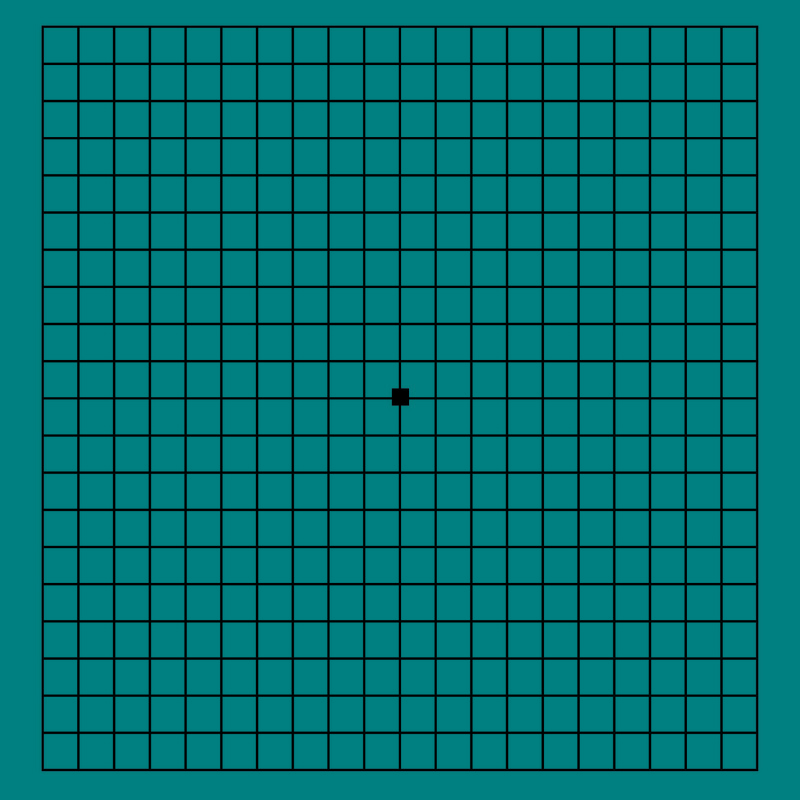 You can check for signs of AMD by looking at a special grid chart like the one above. The most important thing to remember is to cover one eye at a time so that you are testing only one eye each time! Many patients are unaware they have problems in one eye because they are relying on their other good eye. If the straight lines appear wavy or the centre black spot appears blurred, you should have an eye check-up.